by Stephen A. Werner, Ph.D.
At one time or another, we’ve all had some questions about Christianity. Why are there so many different kinds of Christians? What were the last words spoken by Jesus? Why do most churches have organs? 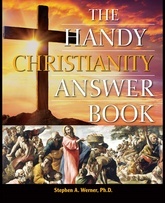 The Handy Christianity Answer Book more than lives up to its name with answers to those questions and hundreds more. This engaging, user-friendly primer looks at the significance of the Bible, Jesus, the Apostles, the Trinity, the Eucharist, historical schisms, different denominations, worship, sacraments, prayer, and much more. Enlightening and entertaining, it’s an important reference guide that answers nearly 900 questions and offers fun facts that cover Christian history, religious practices, and cultural perspectives. Stephen A. Werner, Ph.D., received his doctorate in Historical Study of Christian Theology from Saint Louis University. He has nearly 30 years of experience teaching courses in religion.